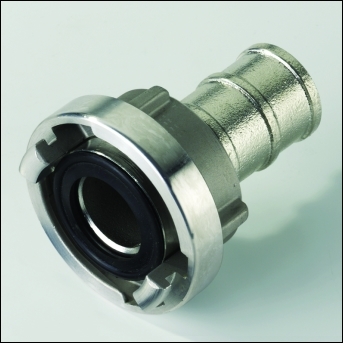 As flexible sealing elements, the seals of the Storz couplings are necessarily subject to greater wear. Although they are manufactured from high-grade elastomers in a wide range of materials to suit the intended application, they must therefore be occasionally replaced, to ensured a proper function of the coupling. All seals are injection-moulded and guarantee extreme dimensional accuracy and unchanging material constants, tensile strenght, elasticity and dimensional stability. All seals are sold in bags. Symetrical quick connection coupling, no female and male part, no problem with matching hose ends. Assembly and functionality of couplings Storz system. Quick connection couplings with DS suffix generally are suitable for delivery and suction operation, without DX suffix for delivery operation only. Designed for a permissible operating pressure of 16 bar.